The figure used for this unit is a Custom figure from the Griffin Mods set. 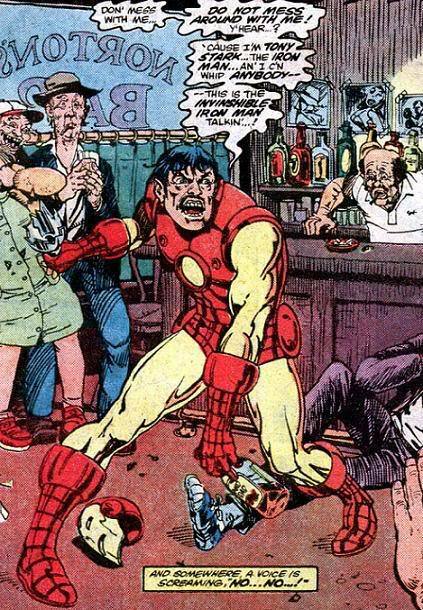 Its model number and name is 911/Intoxicated Iron Man. When attacking with Iron Man, your opponent must choose a target for you. If Iron Man does not inflict a wound after attacking with his normal attack, place him horizontally on his space. Iron Man's Height is 3, his Move is 2, and his Range is 1 for the remainder of the round. Before rolling for initiative, place Iron Man on his space normally. Iron Man may not fly over other figures without becoming engaged, may not fly over obstacles such as ruins, and receives an additional wound if he is hit by a leaving engagement attack. Last edited by tcglkn; April 2nd, 2011 at 03:06 PM. Shouldn't he have super strength? I knew I was forgetting something. It's my first design cut a brother some slack. Do you think people will get that he's drunk from alcohol, though? Insane Psychopath is redundant as well but we've used it where it fits. I like Mean Drunk for him, and want to thank you for making a design I can finally identify with!